When you're weightlifting to gain muscle mass, the urge is to work out as much as you can. But that can actually be counterproductive and lead to muscle loss. Your muscles need plenty of rest and recovery to grow, and how much rest you need between sessions depends on your training intensity and individual recovery factors. Training the same muscle group twice a week is most effective for gaining mass. Muscle growth is a product of the right stimulus, followed by adequate recovery. At the appropriate intensity, resistance training causes small tears in the muscles; after training, when the muscles heal, they adapt by growing stronger and larger. This requires a continuous increase in stimulus, by way of added resistance or repetition. Contrary to what many people believe, muscle growth doesn't occur during the actual training — it occurs during the recovery period. This is a period of heightened muscle protein synthesis (MPS). Therefore, while the stimulus needs to be enough to encourage adaptation, the recovery period needs to be sufficient to accomplish adaptation before you increase the weight load. Read more: Is It Bad to Work Out With Sore Muscles? Muscle protein synthesis lasts, on average, 48 hours. But several factors determine the length of MPS for an individual, including training intensity and conditioning. Your body's muscle synthesis process adapts to training. In newer lifters, muscle protein synthesis remains elevated for longer than in more experienced lifters. Elite athletes may have elevated muscle protein synthesis lasting less than 24 hours after heavy resistance training, while novices may have elevated MPS for 72 hours after a moderately rigorous workout. Training intensity also matters. The more you tax the muscles, the more MPS is stimulated. 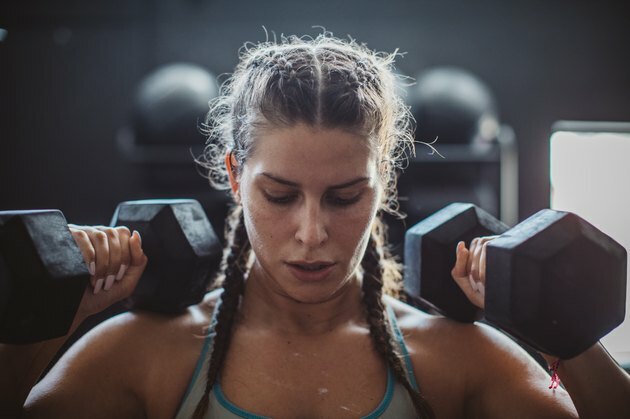 Therefore, a particularly intense workout will extend MPS more than a moderate-intensity workout, and you will need to wait longer before training the same muscle group again. Because not every workout has the same intensity, the length of time you need to wait may differ from week to week. Working out your exact MPS time is nearly impossible without scientific testing. Your individual physiological makeup plays a role, as do lifestyle factors such as nutrition, sleep quality and stress levels. A good rule of thumb is to take the average — 48 hours — and use that as a guide. Pay attention to how you feel and how you perform working the same muscle group after 48 hours, as opposed to waiting 72 hours or longer. If you work out the same muscle group after 48 hours and you feel easily fatigued and notice a loss of strength, you know you need to allow more time for recovery. You may only need to wait two days, or you may need to wait five to seven days, depending on your training volume. Training volume is the number of sets and reps and the amount of weight you lift in each session. The higher the volume, the longer you need to wait between workouts. If you increase the volume, you must increase the recovery time; if you don't want to take as much recovery time, you have to decrease the volume. Some people say it's best to use delayed-onset muscle soreness (DOMS) as a guide. DOMS is the soreness and muscle fatigue you feel in the days following a tough workout. Depending on the intensity of your strength-training routine, you may also experience tenderness to the touch, muscle weakness and swelling. If you're new to strength training, you are more likely to experience DOMS as your muscles adapt to the stimulus. If you have been working out for a while but have recently changed the intensity of your program or added new moves that tax new muscles, you may also experience DOMS. Still, many people don't experience DOMS, so it's not a reliable indication of when you should work out again. However, one thing is certain: If you have DOMS, you should wait to work the same muscle group until the pain and weakness subside. The remedy for overtraining is typically to take time off or to significantly reduce your training volume. This will put a damper on weightlifting for muscle mass gains, so it's crucial to allow enough recovery time and avoid overtraining. On the other hand, you do not want to go too long between workouts. If you allow too much recovery time, you will start to lose your gains. The amount of time you can wait between sessions depends, again, on the training intensity and volume. The bigger the volume, the longer you can go before you risk losses. Unless your training volume is very large, you shouldn't wait more than about five days to train the same muscle group. There are many different ideas regarding the best weekly split for mass gain. Some experts say a five-day split in which you train separate muscle groups with high volume, therefore training each muscle group once a week, is the best plan. Yet others insist that a split in which you train each muscle group twice a week is best. A 2016 review of research in Sports Medicine confirms the efficacy of the latter approach. Researchers analyzed the impact of training frequency on muscle hypertrophy, or growth, and found that training muscles twice a week, at least, led to the greatest gains in the studies they included in the review. However, they were unable to determine whether training three times a week was any more effective. Whether you are doing a five-day workout split or each muscle group twice a week, make sure you are leaving adequate space between training days and balance your volume in each session to ensure proper recovery. You can help recovery along by ensuring adequate calorie and macronutrient intake, maintaining hydration, getting enough quality sleep and reducing your stress levels. If you don't like taking days off, you don't have to. You can engage in active recovery, doing calisthenics, cardio, yoga or stretching. Just make sure you are not putting additional stress on your muscles as they are recovering. Read more: Why Are My Muscles Extremely Sore After Exercise? Barbell Pursuits: How Often Should You Train a Muscle Group? T Nation: How Often Should I Work Out? How Many Days a Week Should I Work Out to Build Huge Muscles?